Rick Barry. Joe Barry Carroll. Sleepy Floyd. Run TMC. Latrell Sprewell. Chris Webber. For years Warriors fans begged and hoped that someone would rescue them from NBA apocalypse. For far too long, the team had been left in shambles and unable to even sniff success. To some, the Dubs were the league’s new laughingstock. Yes, the NBA still had the Clippers, but they had never really experienced anything significant. Everyone around the league knew that Los Angeles was married to the Lakers, and that the Clips were merely the mistress that always knew how to play their position. 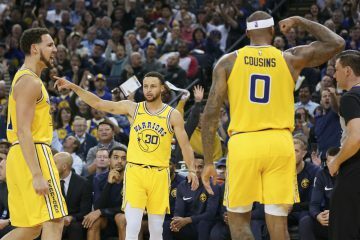 The Warriors on the other hand had once been a proud franchise that had reached the mountain top and laughed at the expense of the rest of the league as they won the NBA title in 1975 with Rick Barry and Jamaal Wilkes. They made the playoffs the two following seasons but then hit a drought in 1978 that extended all the way to the 1986-1987 season. A team led by Joe Barry Carroll dispatched the Utah Jazz in five games in the first round (the first round was a five game series at the time) and then took on the eventual 1987 NBA champs, the Los Angeles Lakers. Although the Lakers easily won that series in five games, die hard NBA fans will always remember Game 4 of that series. If it’s ever on ESPN Classic, please watch it. Golden State guard Sleepy Floyd was the best player on the court that night, in a game that featured Magic Johnson, Kareem Abdul-Jabbar and James Worthy (stop me if you have never heard these names before). Floyd poured in 51 points with 29 of them coming in the fourth quarter as the Warriors won their only game of the series (ESPN columnist Bill Simmons wrote an entire column about this game a few years ago which you can find here), but made it well worth it. By 1988, the team started to change its identity as it got rid of Joe Barry Carroll and Sleepy Floyd, and then turned the team over to Chris Mullin and a rookie by the name of Mitch Richmond. That team went on to make four playoff appearances in the following six seasons; but Richmond was traded away in 1991 during that stretch. The Warriors eventually added talented players such as Latrell Sprewell and Chris Webber to the roster but sadly they were destined to eventually flourish elsewhere. The franchise then became somewhat irrelevant in the homes of most NBA fans after the team’s last playoff appearance of the ‘90’s (1994). Indeed, the franchise’s next 10 years had them winning 298 out of 870 games, which translates into a 34.3% winning percentage. For the sake of putting things into perspective, the Clippers won 285 out of 870 games during the same stretch (32.8% winning percentage). The one Golden State highlight during this period of time? The Sprewell choking incident in 1997. Needless to say, times were tough for Warriors fans. But then, during the 2004-05 season, Golden State took a chance on the then 25 year old point guard that had spent his college days playing basketball at UCLA: Baron Davis. The former Bruin was acquired by trade from the New Orleans Hornets and although he was not necessarily the savior, he would definitely be part of the solution. Davis joined a talented team that lacked direction. The roster featured players such as Andris Biedrins, Jason Richardson, Troy Murphy Mickael Pietrus. Not so coincidentally, the 2006-07 season was Davis’ best in a Warriors uniform, as he led the team to a 42-40 record and a spot in the playoffs as an eight seed. But making the playoffs wasn’t enough for this team. In order for the Dubs to truly once again become relevant, they had to shock the world. And what better way to put the franchise on the map then by defeating the team with the best record in the NBA in the first round? 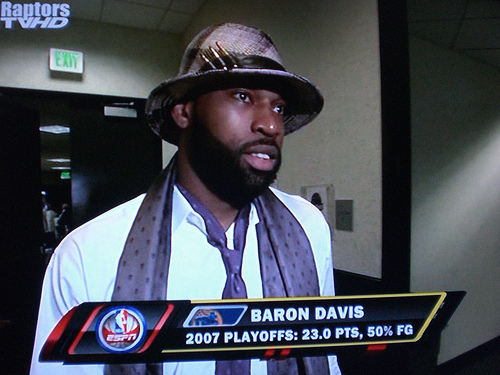 But beyond the numbers, the confidence and the talent, Baron Davis gave us the signature play of the 2007 postseason in Game 3 of the Western Conference Semifinals when he took the ball from the wing and exploded to the basket for an incredible dunk on Andrei Kirilenko. Did I mention he was also fouled on the play? With the Oracle Arena crowd going crazy, and Baron realizing just how incredible his dunk was, he just had to react to the play and earn himself a technical foul. Today, Baron Davis is the Los Angeles Clippers’ starting point guard, but he has left his imprint on the Warriors franchise. 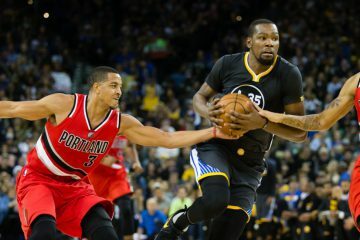 His career averages as a Golden State Warrior are quite impressive: 20.1 points per game (10th best in franchise history), 8.1 assists per game (third best in Warriors history), 2.0 steals per game (second best in the club’s history) and a player efficiency rating of 19.5 (fifth best in franchise history). 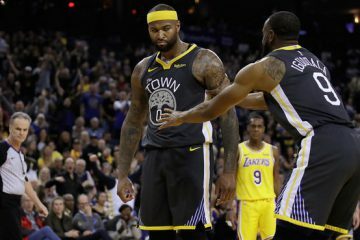 But the biggest stat in Baron’s career cannot be quantified: he brought the team out of a basketball abyss and made everyone care about the Warriors. Whether or not the disease called contract year has affected him in Los Angeles, Baron Davis gave Warriors fans the opportunity to root for a winner. He might not wear a Warriors jersey, but he will always be part of the team. Enjoy his game tonight when the Dubs take on the Clips. J.M. 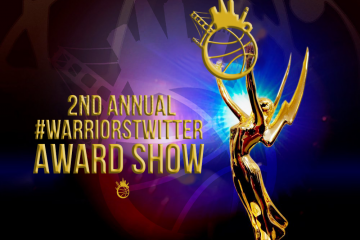 Poulard is a part time contributor for Warriors World and you can follow him on Twitter under the handle name ShyneIV. 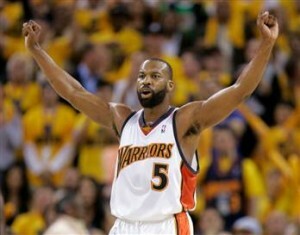 Even to this day, whenever BD comes to Oakland, I’ll sport his jersey to the game and root for my Warriors. Must respect for Baron.. especially for what he and the Dubs did to them Dallas Mavericks. Best Warrior Basketball EVER!!!! Nice article — and a good quick history of the W’s. 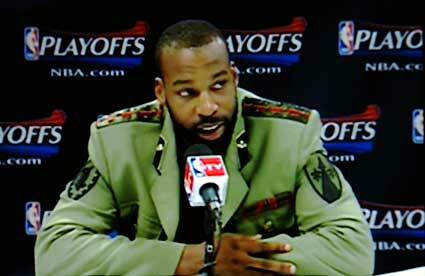 In 2007, I was in the process of becoming an NBA fan once again, but that Warrior team put me over the top. With Baron leading the way, they were so fun to watch. Clifford Ray was on that 1975 team, too. He got dumped from the Celtics staff this season, and I think the team might have done him wrong. Baron was a great Warrior while he was here and I miss those high-flying Warriors. The only time they’ve been relevant in my life. Thanks for the memories Baron and thank you for waiting to go to Los Angeles before you got fat and stopped caring about anything but eating. Subsequently, he’s showing signs of life again. The Clippers are must see TV no matter who they play. Monta Ellis is The Black Swan. I’ll explain.